RPG Maker comes with a built-in encryption system that you can use to protect your resources from distribution to some degree. This tutorial shows you how to encrypt your resources. When the process is complete, go to the output folder and you should see a file with an icon of a blue box. Double-click it to open a dialog that will prompt you to extract the game. Select OK, and your game will be extracted. When the extraction is complete, go into the folder. You should find that all of your data and graphics are not there. However, you will see a “Game.rgss3a” file: this is the encrypted archive where all of the data and graphics are stored. NOTE: Encryption is unavailable in the Lite version. What Happens if I Encrypt my Project? End-users will not be able to load the project in the RPG Maker editor. They will also be unable to simply grab resources from your project for their own use or for distribution. Now you know how to encrypt your data. Now the question is, what actually gets encrypted? Any files or folders outside of these two folders will not be encrypted. So if you want something encrypted, simply drop it in those folders. RPG Maker does not check the file format that you are trying to encrypt. You can add text files, sound files, video files, fonts, and so on. If it is inside one of the “to-be-encrypted” folders, it will be included in the encrypted archive. The issue is whether or not your game will be able to read the file from the encrypted archive. Can I Choose What to Encrypt? This can become an issue because if the purpose of the project was meant to demonstrate how something works and others should be able to open the project in their own editor and look at it, fully encrypting your project would prevent others from doing so. The solution to this is to control what gets encrypted based on how the encryption process works. Remember that any files inside the Data or Graphics folders will be encrypted. We can take advantage of this. For example, let’s say you didn’t want to encrypt the data files. Now you have an encrypted project with unencrypted data files. Note that if you tried to open the project in RPG Maker, it will proceed to delete the encrypted archive, so I don’t know how important this would be. From what I’ve said above, you can also encrypt audio files! Simply take your audio folder and place it in the Data or Graphics folder and they will be encrypted! We can then use scripts such as Simple Audio Encryption to play them. The implementation provided is not very secure in the sense that the audio file is extracted before it’s played, so if you need absolute encryption, you may want to look for a different solution. One possible alternative is the FEUX encryption system. 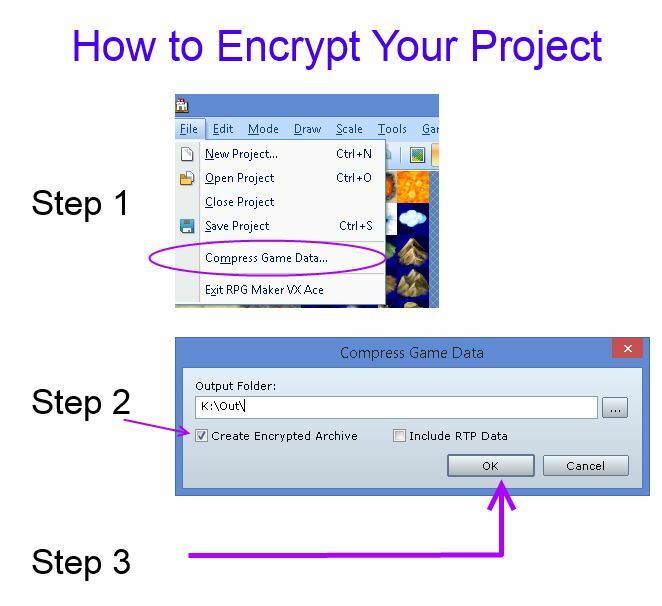 Encrypting your resources when you publish your game can be useful if you don’t want others to easily take your work. Um, what if I use Lite? I still want to encrypt the archives but the option is disabled. If you’re using Lite you won’t be able to create encrypted archives through RPG Maker.